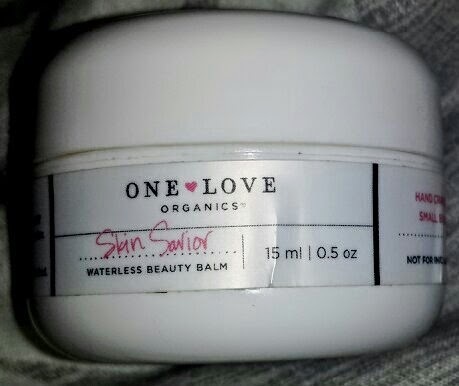 One Love Organics Skin Savior Waterless Balm is a multi-use balm made up of a range of oils, extracts and wax. 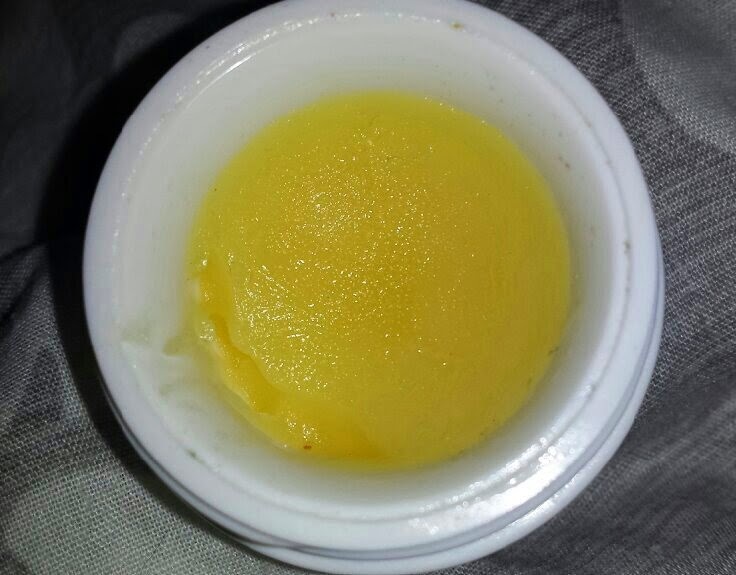 Every single oil and extract is plant based, cold-pressed and blended into this beautiful balm. The extracts and oils are able to clear out all of the dirt in your pores without stripping the protective layer of skin. I have mentioned this cream a couple of times previously in my Top 10 Mulitasking Beauty Products post as well as my Birchbox April 2014 review. It arrived as part of my April Birchbox and I have become obsessed with it! As I explained in my top 10 post, multitasking products are fantastic for busy mums because they're just so darn convenient! Plus, think of the money you save when you have one product that you can use for everything! From this, I decided to set myself a challenge to find as many uses for this balm as I possibly could and write about how each method worked out. In the morning and the evening, apply a small amount of this balm to dry skin (I use it after my normal face wash, but you don’t need to do that if you choose not to) and massage. Rinse of with warm water and then splash your face with cool water. Fantabulously soft and smooth skin! I’ve never had such smooth skin before! Don’t worry if you suffer from breakouts, either. I use this even when I am in the middle of a breakout and I find that it softens any dry patches that can appear from blemishes. This is 100% my favourite use for this balm. What woman doesn’t dream of soft and happy skin? Apply the balm to your face (whilst still wearing makeup) and massage. Wipe off with warm water and a cotton wool pad or face cloth. I find that it takes longer to remove makeup this way in comparison to using a water based cleanser (such as Taaj Himalaya Micellar Water), but it is said that oil based cleansers are supposed to be more efficient at removing makeup (as I was told in Lush). I do see that, and even though it takes a tad longer to remove, you have to use far less product to achieve the results. I split the first two into 1a and 1b because on a Twitter chat last month, Megan-Cáitlín from VENT//threads informed me that this balm was similar to Lush’s Ultrabland cleanser. Therefore, I went to Lush to request a sample of Ultrabland for comparison purposes. 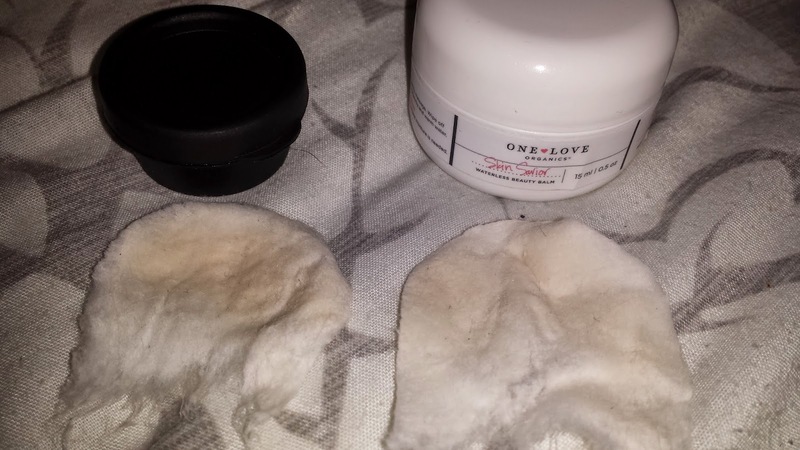 As Ultrabland isn’t a multi-use product, I can only compare it to One Love Organics Skin Savior Balm in regards to a cleanser and makeup remover. One Love Organics - Consistency is harder so more difficult to apply quickly. Takes more scooping from the tub. OLO - Quick and easy, but not as fast at applying as Ultrabland. Make up comes straight off. UB - Quick and easy, comes straight off. I found them to be pretty equal in regards to makeup removal, but even though Ultrabland was far faster to apply and remove, OLO Savior Balm removed more. Apply the balm to dry skin, massage and rinse. As soft as this leaves your skin, I have a confession to make. I found this took a long time to apply just a little bit by little bit, so I only used it for my forearms. I didn’t want to use the whole pot just for one wash, but I figured that my forearms would be enough for experiment purposes. Just like with my face, my skin was super soft. However, it wasn’t as soft as my face ended up. The major downside to using this balm as a body cleanser is pretty obvious really; it takes so long! Apply a small amount of balm to wherever moisture is needed. This depends on where I am applying it. As a full body moisturiser, I had the same issue as with the body cleanser use. It takes so long! Well, it does if you only have a 15ml pot anyway. If you had a full size 105ml pot I'm sure that I would be happier to scoop out a bigger amount to lather all over myself (which I totally would if I could!). However, when used on small areas (such as the knees and elbows) this balm is amazing! Super soft knees and elbows. If you want to use it on your face, it doesn’t take long at all. I find that using it as a face moisturiser leaves my skin feeling oily, but I have very oily skin. Therefore, I much prefer it as a cleanser than a moisturiser. Apply a small amount of balm to the lips. This is amazing as a lip balm! Lips are left super smooth and happy, taking away any dryness that may be there. In comparison to Vaseline, you feel your lips become softer the second that this is applied. *I don’t think it’s wise/safe to eat it even if it is your thing, so don’t do that. Apply a small amount of balm to cuticles and nails. As a cuticle moisturiser I find this to be pretty good. On my nails though it is a completely different story! I hadn’t gotten around to buffing my nails to top up the shine (just the shine bit, don’t over buff you nails with the ridge smoother, kids!) for a few days and my glass-like shine was pretty faded. After applying this balm to my cuticles and nails, my nails looked so close to how they look straight after buffing! It was like it just transformed my nails! They felt stronger, looked shinier and just generally feel better. Amazing! Apply the balm to hands and massage into skin. I found this to be okay as a hand cream, but if you have dry hands then you will probably need a more intense cream. It took a while to apply and quite a while to sink in, but when it had absorbed my hands were left pretty soft. However, it just didn’t amaze me anywhere near as much as how I was after applying it to my nails. Therefore, in regards to your hands, using it on your nails wins for me hands down. If you have any dry patches on your face from past blemishes or if you have over picked a spot and it has scabbed over (we have all been there!) but you want to apply makeup, then it can end up really cakey on the rough patches. To counter this, apply a very small amount of balm to the area you wish to cover with makeup before you start applying it. I love this trick. It really helps to cover any dry patches without anybody being able to notice that the area is dry. I rarely get these type of patches, but when I do I’m never prepared for it because everything I own pretty much is designed for oily skin. Recently though I did have a dry patch on my face after my face products dried out a blemish that then became difficult to cover without it caking. I used the balm and voila! It was far easier to cover and I felt much more at ease. Apply the balm to your face but don’t massage it in. Whilst it sits on your skin, apply face powder on top of it and blend quickly. First, I tried the pre-blend method and it ended up drying so fast that I couldn’t then apply it anywhere, but maybe my powder to balm ratio was incorrect. I’d never tried it before so it was a case of trial and error. I tried it again and the second time I scooped out a bigger amount of the balm and mixed with the powder. It worked a little better, but my version went lumpy in comparison to the smooth version in the video. It applied okay, but the powder settled into every single dry patch and accentuated it to the point where it looked 100 times worse than it actually was. Therefore, I tried the other method; apply the balm to the face and then add the powder. I had mixed results with this. Anywhere that had concealer applied (I figured I should apply concealer first as I predicted that it would be a ‘powder’ finish) turned so incredibly cakey it was unreal. It just would not blend at all. Like I said above, maybe this was because my powder to balm ratio was all wrong, so maybe I should try again sometime. Anywhere that didn’t have concealer, this amazed me! When you apply the powder, the mix dries up so fast. You really do have to blend quickly! If you manage to get it right though, the finish is flawless. I guess that if you have a proper play around with the ratios you can create your own customised coverage level, but I created a medium coverage product with my ratios and it lasted out pretty well. The saddest thing about it all is that you need to be having a really good skin day blemish/dryness wise for this to be worth it. If you have blemishes covered with concealer whilst using this then it really ruins the overall look. Even the smallest amount of concealer just cakes and it doesn’t matter how flawless the rest of your skin looks. In fact, it just makes the cakey parts even more noticeable. You don’t actually even need concealer for this to wreak havoc on any patch that may be slightly drier than the rest of your face. Dab the balm over the area I want to conceal and then use a concealer brush to apply powder over the top and blend. Again, I had mixed results with this. When I got the coverage level right, the dry-o-meter was ready to explode. Anywhere that I covered went so dry that it actually wrinkled up my skin making me look about 30 years older in just very particular areas. If I lessened the amount of powder that I used, the finish was far smoother, but the coverage wasn’t enough for me. I’m going to have to say the same as I did with the foundation; if you have flawless skin, definitely give this and the foundation a go! However, if you have blemishes or dry patches, by all means still try it out, but good luck! You may be able to get the ratios right, so if you have the patience then give it a try! Apply a small amount of balm to areas of hair that you wish to smooth. The first patch that I tested, I used too much. It caused my hair to turn instantly greasy. The second patch I used barely any and the fly away hair was tamed straight away. So, my verdict is that this does work as long as you only use a teeny tiny bit! Apply a small amount to eyebrows, smoothing in the same direction as hair growth. After testing out the hair tamer trick I figured, hey, why not test it on my eyebrows? It tames your eyebrows and keeps them in place beautifully! It’s like applying eyebrow wax that just smells nice. It also leaves your brows feeling super smooth. So there we have it! 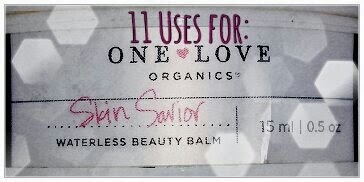 11 uses for One Love Organics Skin Savior Waterless Balm! Overall, my favourite uses for this balm are as a facial cleanser, nail cream, spot softener and a lip balm. I’d love to be able to get the foundation to work out well for me, but I think that it’s going to take a bit more practice to master it. However, like I said, if you have normal skin then definitely give it a go. You should be able to achieve everything that I loved about it without any of the downsides. Along with the uses listed, I was going to use this as a highlighter. I decided not to though because after using it in the foundation trick, I found that if I tried to add any more then the makeup remover side of it kicked in. Therefore, I thought that if I tried it then I’d be just losing makeup rather than adding a highlighter to it! The Skin Savior Waterless Balm is available at Birchbox (£30 for 39ml according to the description, but the photo advertises 100ml) and from the One Love Organics website (£30 for 51ml £52 for 105ml). 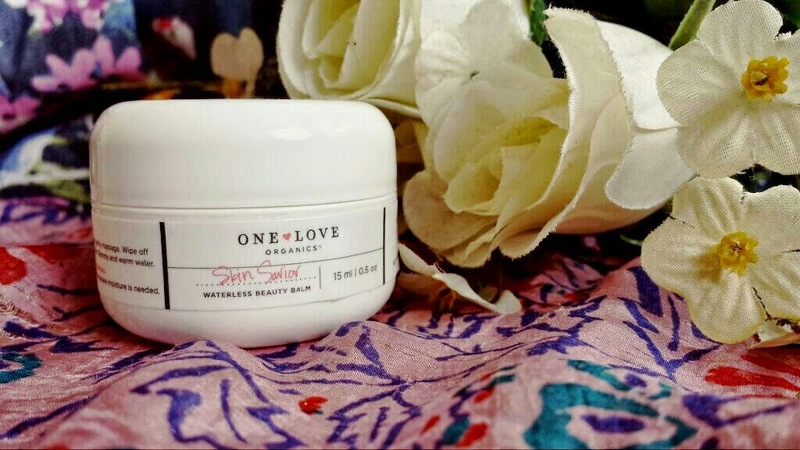 Have you ever tried One Love Organics Skin Savior Balm? How do you use yours?